The foothills of the Sacramento area were once loaded with gold, there is a new rush happening with the explosion of craft beer in California. Sample Sacramento ventures to the Gold Country to visit Cool Beerwerks, Knee Deep Brewing Company and Auburn Ale House. Follow me as I Sample Sacramento Gold Country. Head south on 49 out of Auburn and you’ll find the town of Cool. The opening of Cool Beerwerks in 2013 provided not only great beers to the small community but a serious live entertainment venue as well. The brewery owners, Steve and Rochelle Robello, host national touring comedians and musical acts, which add to the draw of the town’s only brewery. Open 11am to 9pm Wednesday through Sunday, this brewery and taproom also boasts a menu of delicious pub grub and has hand-rolled sushi on Friday nights. The brewpub is spacious with plenty of comfortable seating and an inviting bar. All of the tables provide an excellent view of the stage or of the brewhouse. The shiny, eye catching brew equipment sits behind a wall of glass to the right of the stage. The dimly lit space and great brews create a comforting atmosphere that makes leaving difficult; surely one more beer can’t hurt. One could also enjoy a pint and some grub on the patio or grab a growler of beer to go. I met up with Beers In Sac co-founder Scott, Chris of BEER studio and Nick of API Limo & Brew Talk TV to hang out and enjoy a few brews. Just as I was finishing my sampler, Cool owner Steve set us up with a “Russian Roulette” Roll. As the name implies, this is not your average spicy tuna roll, but is instead a fiery roll where a couple of the pieces are loaded with an extreme hot sauce. Fortunately for me, I did not pull the loaded round, but Scott and Nick were not so lucky. Thankfully, Cool has plenty of delicious brews to quench their thirst! Blonde Diva – This Blonde Ale has a light crackery aroma that is balanced with a floral hop presence that is reminiscent of apple blossoms. The transparent, pale gold ale is capped with a thin head of fine bubbles. Blonde Diva has a light crackery flavor that mingles with subtle floral hop character. The medium body and high carbonation add to the refreshing nature of its dry finish. Steam Punk – An English Strong Ale with aromas of brown sugar, tobacco leaf and toast. It is a deep amber brew crowned with a beige head that fell to a thin slick. The brown sugar noted in the aroma is paired with a flavor reminiscent of raisins and a mild resinous hop that lingers. The medium body and moderate carbonation of Steam Punk paired with the sweet finish make for a brew that would be great paired with dessert, or as dessert. Paranormal – Aromas of citrus rind and pine are balanced against a bready malt backbone in this American Pale Ale. This pale copper beer is topped with bright white foam. The bready malt character noted in the aroma fades to caramel on the palate and is balanced with the citrus hop character that is reminiscent of grapefruit. Paranormal has a medium body and a modest level of carbonation. 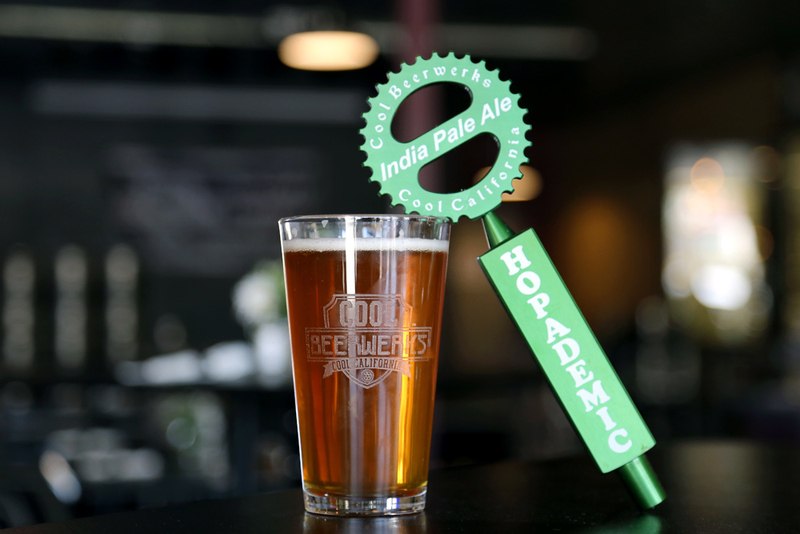 Hopademic – This IPA is redolent with aromas of peach and grapefruit and is balanced against a light malt character. It is pale amber with an off-white head that laces down the sample glass. Hopademic is a well-balanced IPA with malt harmonizing with the bold, but not overly bitter, hop flavors. It has a medium-light body and moderate carbonation that refreshes. Monkey Nuts – Rochelle’s favorite, this stout is an Almond Joy in a glass. Chocolate and coconut are set alongside the mild earthy hop quality. The color of cola graces the edges of this opaque, deep brown brew. The aromas translate directly to the palate. Monkey Nuts is loaded with flavors of milk chocolate, coconut and almonds. It has a full body and a medium level of carbonation which combined make for a satiating beverage. The folks at Cool Beerwerks are pouring their lives into the business and it shows. The well-balanced brews flow alongside tasty food and great company. I had a great time and will most certainly make the short trip up to Cool to have a couple Cool pints.